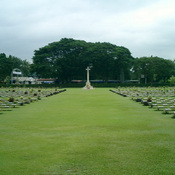 The Don Rak War Cemetery in Kanchanaburi is the final resting place of 6,982 Allied POWs who perished during the construction of the Death Railway during World War II. There is another cemetery at Chungkai just outside Kanchanaburi. Don Rak War Cemetery in Kanchanaburi is maintained in beautiful condition by the Australian Government and is a sober reminder of those who paid the supreme sacrifice so that we could live in peace. 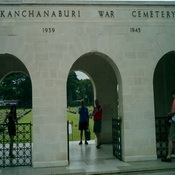 The Kanchanaburi War Cemetery is only a short distance from the site of the former 'Kanburi', the prisoner of war base camp through which most of the prisoners passed on their way to other camps. 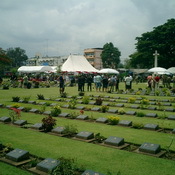 The graves are marked with horizontal bronze plaques set into the grass. Scarlet, purple and white bougainvillaea tumbles over the surrounding walls and flowering trees and shrubs dot the grounds. It seems a strange thing to say, but this is truly a beautiful place. Within the entrance building to the cemetery will be found the Kanchanaburi Memorial, recording the names of eleven men of the army of undivided India buried in Muslim cemeteries in Thailand, where their graves could not be maintained. 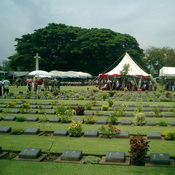 The Don Rak War Cemetery is the location of the ANZAC Day Wreath-laying Ceremony held on 25th April each year. On wet days, the lawn cemetery is off-limits to the public. If you wish to see a specific grave, please bring the number with you as there are two main cemeteries in Kanchanaburi.